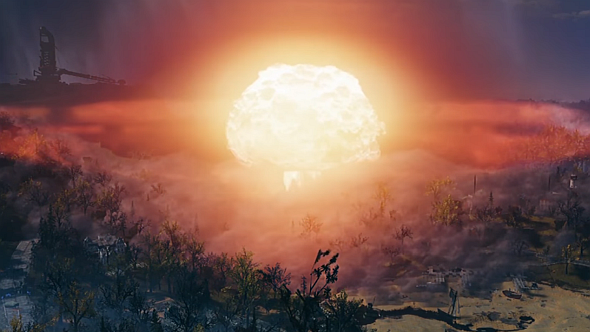 One of the most controversial additions Fallout 76 is making to the series is player-controlled nuclear weapons. You’ll be able to use these to strike other players’ settlements, leveling their structures and irradiating the area. But what if you’re on the receiving end of a nuke? Turns out, your painstaking work building the most beautiful base in West Virginia hasn’t all gone to waste: you’ll be able to rebuild your structures using Fallout 76’s blueprint system. During a panel discussion at QuakeCon, Fallout 76 development director Chris Mayer explained that the team didn’t want players to feel too frustrated by lost effort when they’re the victims of a nuclear strike. The structures you build in the game will have saved blueprints associated with them, so in the event of a catastrophic attack, bases can be rebuilt as long as you’ve got the necessary materials on hand. This also means you’ll be able to quickly pack up and move your custom camp, if you decide to head out for greener pastures or country-er roads. Head on over to our roundup of everything we know about Fallout 76 for more details. It’ll be coming out November 14, and Bethesda will be holding a beta beforehand.